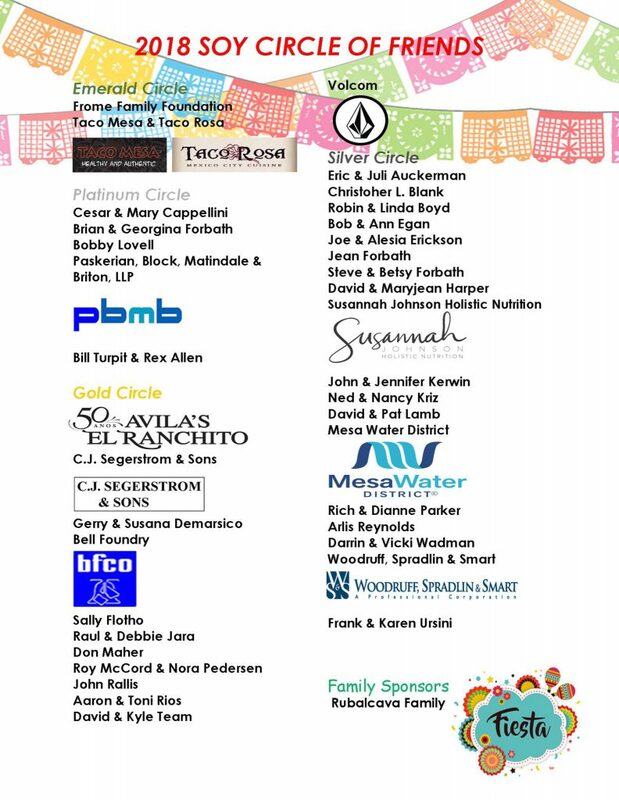 The 10th Annual SOY FIESTA will be a celebration of our 25th Anniversary. Come celebrate our mission and hear from our SOY students and SOY Alumni on how SOY has changed their lives. Also help us honor special board members for their service these past 25 years. Don’t miss this exciting event with the Mexican Flare of a Cinco de Mayo Celebration with margaritas and appetizers with entertainment from our SOY students and alumni. Then dinner and dessert will be served. All food is catered by Ivan Calderon, SOY Board member and owner of Taco Rosa and Taco Mesa. Great Silent Auction opportunities and Live Auction Items as well this year. More updates to come, don’t forget to check back in to this website for more information. $50 of the $100 ticket is tax deductible.